Dr. Noshir Hormasji Antia, born in 1922, was a plastic surgeon of international repute. After graduating from the Grant Medical College in 1945, he served for two years as a medical officer in the Indian Army. He then went to England for further training in surgery. When he was in England, he was very impressed by the work of Sir Harold Gillies, the father of Plastic Surgery that he decided to work with Sir Harold and then to practice this specialty when he returned home. On his return to India, he started working at the Jehangir Nursing Home in Poona as a General Surgeon who also practiced Plastic Surgery. Within three years, the Government of Maharashtra became aware of the good work he was doing and invited him to start a Plastic Surgery Unit at the Grant Medical College in Bombay. Since his relationship with Sir Harold Gillies was indeed strong, the Unit was inaugurated by Sir Harold. The House of Tata was so impressed by the work done there that they offered to finance the unit and so the unit became the "Tata Department of Plastic Surgery". The department soon became an internationally renowned centre, where generations of Indian Plastic Surgeons have been trained. Working with Dr. Antia was indeed a very special experience. He was not only an excellent surgeon and a great teacher; he was an ethical and compassionate man who taught his students to look after the poor and the unfortunate and give them the best treatment possible. 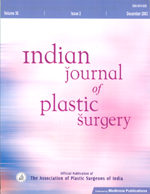 Dr. Noshir Antia was also instrumental in establishing the Association of Plastic Surgeons of India in 1957, and a few years later, the National Societies for Burns and Hand Surgery. He was also a pioneer in the field of Leprosy Surgery and because of the good results he achieved, he was awarded the Hunterian Professorship of the Royal College of Surgeons in 1962. In the midst of a flourishing surgical career, Dr Antia even took 2 years off to spend in research in Immunology at London. Many thought that it was surgical suicide; however, once again, Antia did what he thought was best to his patients. Very often, we hear that Indian contribution to scientific paper publication is lamentably low as compared to what it could be. Dr Antia is a stunning exception. A search of PubMed would reveal that he has 182 publications in peer reviewed journals - the first one appearing in 1955 and the last one in 2006! Many of his articles stand relevant to our practice even today. The study of it also reveals the evolution of Dr. Antia, the man . The publications range from simple treatment vignettes (Use of Cephalic Vein in intravenous therapy in BMJ in 1955 - his first article in a peer reviewed journal) to Microsurgery to Economic models of healthcare. He was one of the first to clinically attempt free tissue transfers, which he published in the Jan 1971 issue of British Journal of Plastic Surgery (Transfer of an Abdominal Dermo fat graft by Direct Anastomosis of Blood vessels. Antia NH, Buch VI Brit J Plast Surg 1971). Unfortunately, the transfer failed after a few days. He ended the article with the words, 'Nevertheless, the technical feasibility of transfer of abdominal wall to the face by direct vascular anastomosis has been demonstrated and justifies further trial'. He was thus a true pioneer in various aspects of Plastic Surgery. His life reveals that it is the enquiring mind and will to do that matters rather than the infrastructure in which one worked. His achievements were numerous and in various spheres of Plastic Surgery. Not surprisingly, he was elected President of the International Congress of Plastic and Reconstructive Surgery in 1987 in New Delhi. He was also highly appreciated for his work by professional peers. He was the Gilles and Sushruta orator of APSI, Hunterian Professor and the Clayton Memorial Lecturer of the Royal College of Surgeons of England, Maliniac Lecturer of the American Society of Plastic and Reconstructive Surgeons, Pandalai Orator of Association of Surgeons of India and so on. The list is long, but those of us who heard him deliver the BB Joshi oration in the Indian Society for Surgery of the Hand in Bangalore or inaugurate the APSI at Hyderabad last year in 2006 would agree that the honours did not affect the man. From 1968, his interest widened to include Biomedical and Socio-medical Research and this led to the establishment of the "Foundation for Medical Research" and the "Foundation for Research in Community Health". He was also an outspoken proponent of "Panchayati Raj" and "Rural Development" and had served on several National and International Committees and Panels associated with them. His last few years were spent in empowering village women as health workers and teaching them to use the 'Right to Information Act' to get their legitimate dues from an often difficult political bureaucratic setup. In recognition of his many contributions to Health in general, particulary Plastic Surgery, he was awarded the Padma Shri in 1990 by the Government of India and the G. D. Birla International Award for Humanism in 1994 as well as the Karma yogi Puraskar in 2006. For Plastic Surgeons in India and the entire world, he was a renowned figure and his work will never be forgotten. His passing away is indeed sad, but it is certain that he will be remembered for his contribution to Plastic Surgery in particular and Health in general for many years to come.